Mehdi Ghadyanloo is an Iranian artist known for his utopian and philosophical paintings that interrogate universal human precepts such as fear, hope and loss. Through the portrayal of minimal heterotopic environments, surreal architectural arrangements, and the repeated use of symbolic elements such as stairs, balloons and aeroplanes, Ghadyanloo invites us to consider new realities and the shared universality of our existence. Ghadyanloo has always lived in Iran and grew up on a farm during the Iran-Iraq war. The uncertain experiences of war and sanctions had a lasting effect on his psyche. Through his works Ghadyanloo subconsciously encapsulates and expresses a sense of suspension for an entire generation living in Iran. Although at times somber, Ghadyanloo’s work conveys hope that change can be effected, and it speaks with joy of what remains glorious in gloomy times. Aside from his works on canvas, a wide range of print making techniques, and sculpture, Ghadyanloo is also one of Iran’s foremost public artists. 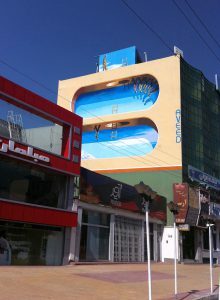 After answering an open call from the Municipality of Tehran’s Beautification Bureau, Ghadyanloo painted over 100 gigantic murals throughout Tehran between 2004 and 2011.